For other people named Jim Lee, see Jim Lee (disambiguation). 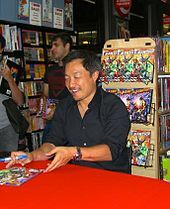 Jim Lee (Korean 이용철; born August 11, 1964) is a Korean American comic-book artist, writer, editor, and publisher. He is currently the Co-Publisher and Chief Creative Officer of DC Comics. In recognition of his work, Lee has received a Harvey Award, Inkpot Award and three Wizard Fan Awards. He entered the industry in 1987 as an artist for Marvel Comics, illustrating titles such as Alpha Flight and The Punisher War Journal, before gaining popularity on The Uncanny X-Men. X-Men No. 1, the 1991 spin-off series premiere that Lee penciled and co-wrote with Chris Claremont, remains the best-selling comic book of all time, according to Guinness World Records. In 1992, Lee and several other artists formed their own publishing company, Image Comics to publish their creator-owned titles, with Lee publishing titles such as WildC.A.T.s and Gen¹³ through his studio WildStorm Productions. Eschewing the role of publisher in order to return to illustration, Lee sold WildStorm in 1998 to DC Comics, where he continued to run it as a DC imprint until 2010, as well as illustrating successful titles set in DC's main fictional universe, such as the year-long "Batman: Hush" and "Superman: For Tomorrow" storylines, and books including Superman Unchained, and the New 52 run of Justice League. On February 18, 2010, Lee was announced as the new Co-Publisher of DC Comics with Dan DiDio, both replacing Paul Levitz. Lee was born on August 11, 1964 in Seoul, South Korea. He grew up in St. Louis, Missouri, where he lived a "typical middle-class childhood". Though given a Korean name at birth, he chose the name Jim when he became a naturalized U.S. citizen at age 12. Lee attended River Bend Elementary School in Chesterfield and later St. Louis Country Day School, where he drew posters for school plays. Having had to learn English when he first came to the U.S. presented the young Lee with the sense of being an outsider, as did the "preppy, upper-class" atmosphere of Country Day. As a result, on the rare occasions that his parents bought him comics, Lee's favorite characters were the X-Men, because they were outsiders themselves. Lee says that he benefited as an artist by connecting with characters that were themselves disenfranchised, like Spider-Man, or who were born of such backgrounds, such as Superman, who was created by two Jewish men from Cleveland to lift their spirits during the Depression. His classmates predicted in his senior yearbook that he would found his own comic book company. Despite this, Lee was resigned to following his father's career in medicine, attending Princeton University to study psychology, with the intention of becoming a medical doctor. In 1986, as he was preparing to graduate, Lee took an art class that reignited his love of drawing, and led to his rediscovery of comics at a time when seminal works such as Frank Miller's The Dark Knight Returns and Alan Moore and Dave Gibbons' Watchmen spurred a renaissance within the American comics industry. After obtaining his psychology degree, he decided to postpone applying to medical school, and earned the reluctant blessing of his parents by allotting himself one year to succeed, vowing that he would attend medical school if he did not break into the comic book industry in that time. He submitted samples to various publishers, but did not find success. When Lee befriended St. Louis-area comics artists Don Secrease and Rick Burchett, they convinced him he needed to show his portfolio to editors in person, prompting Lee to attend a New York comics convention, where he met editor Archie Goodwin. Goodwin invited Lee to Marvel Comics, where the aspiring artist received his first assignment by editor Carl Potts, who hired him to pencil the mid-list series Alpha Flight, seguéing from that title in 1989 to Punisher: War Journal. Lee's work on the Punisher: War Journal was inspired by artists such as Frank Miller, David Ross, Kevin Nowlan, and Whilce Portacio, as well as Japanese manga. In 1989, Lee filled in for regular illustrator Marc Silvestri on Uncanny X-Men No. 248 and did another guest stint on issues No. 256 through No. 258 as part of the "Acts of Vengeance" storyline, eventually becoming the series' ongoing artist with issue No. 267, following Silvestri's departure. During his stint on Uncanny, Lee first worked with inker Scott Williams, who would become a long-time collaborator. During his run on the title, Lee co-created the character Gambit with long-time X-Men writer Chris Claremont. Lee's artwork quickly gained popularity in the eyes of enthusiastic fans, which allowed him to gain greater creative control of the franchise. In 1991, Lee helped launch a second X-Men series simply called X-Men volume 2, as both the artist and as co-writer with Claremont. X-Men vol. 2 No. 1 is still the best-selling comic book of all-time with sales of over 8.1 million copies and nearly $7 million, according to a public proclamation by Guinness World Records at the 2010 San Diego Comic-Con. The sales figures were generated in part by publishing the issue with five different variant covers, four of which show different characters from the book that formed a single image when laid side by side, and a fifth, gatefold cover of that combined image, large numbers of which were purchased by retailers who anticipated fans and speculators who would buy multiple copies in order to acquire a complete collection of the covers. Lee designed new character uniforms for the series, including those worn by Cyclops, Jean Grey, Rogue, Psylocke and Storm and created the villain Omega Red. Actor/comedian Taran Killam, who has ventured into comics writing with The Illegitimates, has cited X-Men No. 1 as the book that inspired his interest in comics. Stan Lee interviewed Lee in the documentary series The Comic Book Greats. Enticed by the idea of being able to exert more control over his own work, in 1992, Lee accepted the invitation to join six other artists who broke away from Marvel to form Image Comics, which would publish their creator-owned titles. Lee's group of titles was initially called Aegis Entertainment before being christened WildStorm Productions, and published Lee's initial title WildC.A.T.s, which Lee pencilled and co-wrote, and other series created by Lee in the same shared universe. The other major series of the initial years of Wildstorm, for which Lee either created characters, co-plotted or provided art for, included Stormwatch, Deathblow and Gen¹³. In 1993, Lee and his friend, Valiant Comics publisher Steve Massarsky, arranged a Valiant-Image Comics crossover miniseries called Deathmate, in which the Valiant characters would interact with those of WildStorm, and of Lee's fellow Image partner, Rob Liefeld. The miniseries would consist of four "center books" (each one denoted by a color rather than an issue number), two each produced by the respective companies, plus a prologue and epilogue book. Wildstorm produced Deathmate Black, with Lee himself contributing to the writing. He illustrated the covers for that book, the Deathmate Tourbook and the prologue book, as well as contributing to the prologue's interior inks. WildStorm would expand its line to include other ongoing titles whose creative work was handled by other writers and artists, some of which were spinoffs of the earlier titles, or properties owned by other creators, such as Whilce Portacio's Wetworks. As publisher, Lee later expanded his comics line creating two publishing imprints of WildStorm, Homage and Cliffhanger (that years later merged and were replaced by a single WildStorm Signature imprint), to publish creator-owned comics by some selected creators of the US comics industry. Lee and Rob Liefeld, another Marvel-illustrator-turned-Image-founder, returned to Marvel in 1996 to participate in a reboot of several classic characters; the project was known as Heroes Reborn. While Liefeld reworked Captain America and The Avengers, Lee plotted Iron Man and plotted and illustrated Fantastic Four issues #1-6. Halfway through the project, Lee's studio took over Liefeld's two titles, finishing all four series. According to Lee, Marvel proposed continuing the Heroes Reborn lineup indefinitely, but under the condition that Lee would draw at least one of them himself, which he refused to do. Instead, he accepted an offer to re-imagine and relaunch (in the role of editor) three mainstream Marvel Universe titles: Defenders, Doctor Strange, and Nick Fury. Though scheduled to debut in December 1997, these three relaunches never appeared. Lee returned to WildStorm, where he would publish series such as The Authority and Planetary, as well as Alan Moore's imprint, America's Best Comics. Lee himself wrote and illustrated a 12-issue series called Divine Right: The Adventures of Max Faraday, in which an internet slacker inadvertently manages to download the secrets of the universe, and is thrown into a wild fantasy world. Because he felt his role as publisher and his growing family demands interfered with his role as an artist, Lee left Image Comics and sold WildStorm to DC Comics in late 1998, enabling him to focus once again on art. He drew a "Batman Black and White" backup story for the first issue of Batman: Gotham Knights (March 2000). In 2003, he collaborated on a 12-issue run on Batman with writer Jeph Loeb. "Hush" became a sales success. He followed this up in 2004 by illustrating "For Tomorrow", a 12-issue story in Superman by writer Brian Azzarello. In 2005, Lee teamed with Frank Miller on All Star Batman & Robin, the Boy Wonder, a series plagued by delays, including a one year gap between the releases of the fourth and fifth issues. Lee himself took full responsibility for the delays, explaining that his involvement with the DC Universe Online video game were the cause, and not Miller's scripts, which had been completed for some time. All-Star also drew controversy for Miller's dialogue, pacing and depiction of the characters, garnering reviews that were mixed to negative, though Lee's art was praised, and the book enjoyed excellent sales. A total of 10 issues were produced of that series, the tenth issue being released on September 24, 2015. In September 2015 Lee indicated the possibility of returning to the book to conclude it with Miller's originally intended ending, but this series was never produced. Lee continued to run WildStorm as Editorial Director, sometimes working on both DC and WildStorm properties simultaneously. In September 2006, Lee returned to WildC.A.T.s with Grant Morrison as the writer, but only one issue that series' fourth volume was published. Lee provided artwork for the album booklet for Daughtry's 2009 album Leave This Town. In February 2006, it was announced that Lee would be involved with the concept art for the DC Comics online game DC Universe Online. In 2008, Lee was named the Executive Creative Director of the forthcoming game, which at that time was expected to be released in 2009. In February 2010, Lee and Dan DiDio were named Co-Publishers of DC Comics by DC Entertainment President Diane Nelson. According to Lee, this did not indicate another move away from the creative side of comics, as his Co-Publishing duties granted him greater creative involvement in the entire DC line and allow him to illustrate titles. DC announced they were ending the WildStorm imprint in September 2010. In September 2011, DC Comics instituted an initiative called The New 52, in which the publisher cancelled all of its superhero titles and relaunched 52 new series with No. 1 issues, wiping out most of the then-current continuity. Lee and writer Geoff Johns, DC Comics' Chief Creative Officer, are the architects of the relaunch, which was initiated with a new Justice League series, written and illustrated by Johns and Lee, respectively. The series' first story arc was a new origin of the Justice League, which depicted the return of DC's primary superheroes to the team. Lee's illustration for the cover of issue No. 12 drew media attention for its depiction of Superman and Wonder Woman in a passionate embrace, a rendition that Lee said was inspired by Gustav Klimt's painting The Kiss and Alfred Eisenstaedt's 1945 photograph V-J Day in Times Square. In July 2012, as part of the San Diego Comic-Con, Lee and Dan DiDio participated in the production of "Heroic Proportions", an episode of the Syfy reality television competition series Face Off, in which special effects makeup artists compete to create the best makeup according to each episode's theme. Lee and DiDio presented the contestants with that episode's challenge, to create a new superhero, with six DC Comics artists on hand to help them develop their ideas. The winning entry's character, Infernal Core by Anthony Kosar, was featured in Justice League Dark #16 (March 2013), which was published January 30, 2013. The episode premiered on January 22, 2013, as the second episode of the fourth season. In October 2012, DC Entertainment and Kia Motors America entered a partnership to benefit We Can Be Heroes, a campaign dedicated to fighting hunger in the Horn of Africa. The campaign involves the creation of eight Justice League-inspired vehicles, on whose designs Lee collaborated. Each vehicle is tied thematically to a member of the Justice League, the first of which was a Batman-themed Kia Optima. A Superman-themed version inspired by Lee's art followed in February 2013. In 2014, General Mills enlisted the help of DC Comics to create new designs for its monster-themed cereals in time for Halloween. The designs, revealed on August 6, consisted of a Boo Berry design by Lee, a Count Chocula design by Terry Dodson and a Franken-Berry design by Dave Johnson. Describing the task of designing a cartoon character, Lee explained, "Drawing simpler characters is a lot more work and harder than drawing something that's more complicated or has a lot of renderings. Every line counts and every distance between the eyes and the ears, it's all super critical." In February 2015, DC released The Multiversity: Mastermen, the seventh issue of Grant Morrison's The Multiversity project, which Lee illustrated. That November saw the debut of the miniseries Batman: Europa, on which Lee collaborated with writers Brian Azzarello and Matteo Casali and artist Giuseppe Camuncoli. The book, which was inspired by Lee's time living in Italy, was originally announced by DC in 2004, and intended to feature Lee's painted art over Camuncoli's layouts, but after a series of delays, it published with conventional artwork as a four-issue miniseries to positive reviews. In 2016, Lee was the main artist on the one-shot Harley Quinn and the Suicide Squad April Fool's Special sharing art duties on that book with Sean Galloway. That August, DC released the first of eight issues of Lee and writer Rob Williams new Suicide Squad series, as part of the DC Rebirth relaunch. In July 2017, Marvel decided to capitalize on Lee's popularity by releasing 29 of its books with covers reprinting Lee's art for its 1992 Series 1 X-Men trading cards. In March 2018, Lee and writer James Tynion IV launched the series The Immortal Men as part of DC's New Age of Heroes line. That June, following the departure of DC Entertainment's Diane Nelson, and Geoff Johns' stepping down from his role as Chief Creative Officer (CCO) of DC Comics, Lee was named DC's COO, a role he would assume while continuing to act as publisher with Dan DiDio. Lee is known to use F lead for his pencil work. While inking his own pencils on The Punisher War Journal, Lee began using a crowquill nib for the first time. In talking about the artist's work ethic, Lee has said, "Sometimes I wonder if we ever really improve as artists or if the nirvana derived from completing a piece blinds us enough to love what we have created and move on to the next piece. If we could see the work as it is, with years of reflection in the here and now, how many images would end up in the trash rather than on the racks?" In a 1996 interview with The Comics Journal, writer/illustrator Barry Windsor-Smith criticized the depth of the work of artists like Lee and Rob Liefeld, and those whom they influenced (whom he referred to as "the Liefelds and the Lees"), stating, "Your Jim Lees and all this lot, their product hasn't got anything to do with them, you know? There is no emotional investment...I look at Jim Lee's work, and the guy's learning how to draw. He has some craft to what he does...I don't think it has even crossed their minds that comic books can be a medium for intimate self-expression." The Comics Journal publisher Gary Groth concurred, stating "Lee's work is obviously more technically accomplished than Liefeld's, but otherwise it's conceptually comparable." Windsor-Smith added that he believed in the Image Comics' founders' exodus from Marvel Comics as an important step for creator autonomy and creator rights, and was angered when they returned to Marvel to do "Heroes Reborn". Lee, his wife Carla Michelle (nee Vorhies) and their children lived in Italy for a time. They had three children as of March 1999. In 2012, when Carla was pregnant again, Lee included a tribute to her in Justice League #5, writing "I LOVE CARLA" on the shattered windshield of a car onto which Batman jumps. As of August 2013, Lee and Carla Michelle had eight children, with their ninth due later that year. In the 1990s, Lee bought two pages of Jack Kirby concept art, which Kirby had created for a film adaptation of Roger Zelazny's novel Lord of Light, as part of the cover story to smuggle Americans out of Iran during the 1980 hostage crisis. Lee purchased the art at a Sotheby's auction via Barry Geller, the producer of the faux film, who was selling it to help pay for his child's college tuition. Although the CIA operation that rescued the Americans remained classified for another 17 years, and thus Lee had no idea of the pages' historical significance, nor did Geller know their true monetary value when he sold them to help pay his son's college tuition (with Kirby's permission). Both Lee and Geller learned of the true story behind the art years later with the rest of the public. In August 2013, four of Lee's children were headed for college, and he and Carla decided to auction off the art through Heritage Auctions in order to pay for their education. ^ "About This Person: Jim Lee". IGN. Archived from the original on January 19, 2014. Retrieved January 18, 2013. ^ a b c Kerman, Byron (July 2010). "Comic Genius". St. Louis Magazine. Archived from the original on August 7, 2011. ^ a b c d e f g h i Lee, Jim; Baker, Bill (2010). Icons: The DC Comics & WildStorm Art of Jim Lee. Titan Books. pp. 8 and 10. ISBN 978-1845765194. ^ Lee, Jim (November 14, 2017). Batman Hush: The 15th Anniversary Deluxe Edition, DC Comics (Burbank, California), p 308. ^ a b c d e Tantimedh, Adi (February 25, 2006). "New York Comic Con, Day One: Jim Lee Spotlight". Comic Book Resources. Archived from the original on December 27, 2013. ^ a b c Gaffney, Suzanne. "Co-Conspirators Talk". The Punisher War Journal. Marvel Comics. December 1988. ^ Morse, Ben (August 10, 2010). "SDCC 2010: Marvel Breaks World Record". Marvel Comics. ^ Johnston, Rich (July 22, 2010). "X-Men #1 The Guinness World Record Best Selling Comic Of All Time?". Bleeding Cool. Archived from the original on October 16, 2013. ^ Miller, John Jackson (November 16, 2010). "X-Men #1, One Piece, and world records". The Comics Chronicles. Archived from the original on November 19, 2010. ^ Manning "1990s" in Gilbert (2008), p. 280: "Part of the 'Heroes Reborn' event, Iron Man was relaunched into a new universe courtesy of writers Scott Lobdell and Jim Lee, with pencils by Whilce Portacio." ^ Manning "1990s" in Gilbert (2008), p. 280: "Jim Lee both wrote and drew this Heroes Reborn relaunch title with the help of fellow scripter Brandon Choi." ^ McLauchlin, Jim (August 1997). "Lee Extends 'Reborn' Run". Wizard (72). pp. 18–19. ^ a b Lee, Jim (March 1999). "Welcome and Happy New Year!". Wildcats (vol 2) #1 WildStorm Productions, p. 27. ^ "Jim Lee". Lambiek Comiclopedia. July 13, 2012. Archived from the original on May 16, 2013. ^ Cowsill "2000s" in Dolan, p. 321: "Writer Frank Miller and artist Jim Lee got things started in the first release for the new imprint - All Star Batman & Robin, the Boy Wonder." ^ Barringer, John (August 1, 2009). "All Star Batman and Robin Update: Jim Lee Interview". A Comic Book Blog. Archived from the original on December 27, 2013. ^ MOntgomery, Paul (April 2, 2010). "All-Star Batman and Robin to Conclude Next Year…Sort of". iFanboy. Archived from the original on December 28, 2013. ^ Frankenhoff, Brent (June 6, 2006). "All-Star Batman and Robin #5 delays end". Iola, Wisconsin: Comics Buyer's Guide. Archived from the original on December 28, 2013. ^ "". Associated Press/Daily News (New York). September 12, 2008. Retrieved April 20, 2019. ^ a b c Moore, Benjamin (September 29, 2015). "Frank Miller's 'All-Star Batman And Robin,' The Worst Comic Ever, Might Finally Get An Ending". Forbes. Retrieved April 20, 2019. ^ a b c Gatevackes, William (February 10, 2006). "All-Star Batman & Robin #1-3". PopMatters. Archived from the original on January 18, 2010. ^ a b "ALL-STAR BATMAN AND ROBIN THE BOY WONDER". Comic Book Round Up. Retrieved April 20, 2019. ^ Robinson, Iann (December 17, 2007). "All Star Batman and Robin" Archived January 18, 2010, at WebCite. CraveOnline. ^ Sanderson, Peter (February 6, 2006). "Comics in Context #119: All-Star Bats". IGN. ^ "ALL-STAR BATMAN AND ROBIN THE BOY WONDER #10". Comic Book Round Up. Retrieved April 20, 2019. ^ "Jim Lee Says Frank Miller Has a 'Really Cool' All Star Batman & Robin Finale". Comic Book Resources. September 29, 2015. Archived from the original on September 23, 2016. ^ LeTendre, Brian (July 15, 2008). "E3 2008: Jim Lee talks DC Universe Online". Archived from the original on November 15, 2008. Retrieved May 19, 2009. ^ Hyde, David (February 18, 2010). "Jim Lee and Dan DiDio Named Co-Publishers DC Comics. Geoff Johns to Serve as Chief Creative Officer. John Rood Named EVP, Sales, Marketing and Business Development. Patrick Caldon Named EVP, Finance and Administration". DC Comics. Archived from the original on February 21, 2010. The new senior executive team includes Jim Lee and Dan DiDio, who have been named Co-Publishers of DC Comics, and Geoff Johns, who would serve as Chief Creative Officer of DC Entertainment. ^ Johnston, Rich (February 18, 2010). "DC Announces New Publisher – All Five Of Them!". Bleeding Cool. Archived from the original on December 28, 2013. ^ Segura, Alex (April 2, 2010). "What's Next for Frank Miller and Jim Lee?". DC Comics. Archived from the original on October 19, 2013. ^ Ching, Albert (September 21, 2010). "DC Co-Publishers Announce End of Widstorm Imprint, Zuda". Newsarama. Archived from the original on November 10, 2013. ^ Manning "2010s" in Dougall, p. 319: "The Justice League was formed for the first time in the landscape of the fresh universe of the New 52 thanks to writer Geoff Johns and artist Jim Lee." ^ Truitt, Brian (May 3, 2011). "DC Comics ready for a risky yet relevant publishing change". USA Today. Archived from the original on February 10, 2014. ^ Jensen, Jeff (August 22, 2012). "Justice League #12: DC reveals Superman's new leading lady... and it's a doozy -- Exclusive". Entertainment Weekly. Archived from the original on January 7, 2014. ^ Langshaw, Mark (August 22, 2012). "Justice League to feature new Superman romance". Digital Spy. Archived from the original on December 27, 2013. ^ Khouri, Andy (August 22, 2012). "Superman + Wonder Woman = <3 In Justice League #12 (Kissy Kissy)". ComicsAlliance. Archived from the original on December 28, 2013. ^ Montgomery, Paul (August 22, 2012). "Superman & Wonder Woman Sitting in a Tree, K-I-S-S-I-N-G in Justice League #12 and Beyond". iFanboy. Archived from the original on December 28, 2013. ^ Melrose, Kevin (January 16, 2013). "Dan DiDio, Jim Lee and DC artists to appear on Syfy's Face Off". Comic Book Resources. Archived from the original on June 18, 2018. ^ "Dan DiDio, Jim Lee and DC Entertainment's Stellar Talent to Guest Star on SYFY's Hit Competition Series Face Off". DC Comics. January 16, 2013. Archived from the original on June 18, 2018. ^ Nguyen, Minhquan (February 1, 2013). "Justice League Dark #16 – Review". Weekly Comic Book Review. Archived from the original on February 8, 2013. ^ "Heroic Proportions", Face Off, Season 4, Episode 2. Syfy, January 22, 2013. ^ Nicholson, Max (October 3, 2012). "DC and Kia Team Up for JLA Car Fleet". IGN. Archived from the original on October 7, 2012. ^ Nicholson, Mac (October 11, 2012). "The Batman Kia Optima Comes in Black". IGN. Archived from the original on August 18, 2013. ^ "Superman-Inspired Kia Optima Soars Into Chicago For Auto Show Debut". Kia Motors. February 7, 2013. Archived from the original on August 8, 2016. ^ Yin-Poole, Wesley (June 3, 2013). "Mortal Kombat's Scorpion is the next DLC character in Injustice: Gods Among Us". Eurogamer. Archived from the original on October 22, 2013. ^ Armitage, Hugh (January 20, 2013). "DC Comics unveils Superman offering for Free Comic Book Day 2013". Digital Spy. Archived from the original on July 5, 2013. Scott Snyder and Jim Lee's forthcoming Superman monthly title will be previewed in the issue. ^ Esposito, Joey (March 4, 2013). "Scott Snyder and Jim Lee's Superman Unchained Confirmed for June". IGN. Archived from the original on August 9, 2013. ^ Sunu, Steve (August 6, 2014). "Jim Lee, Dave Johnson, Terry & Rachel Dodson Redesign General Mills' Monster Cereals". CBR.com. Archived from the original on October 22, 2014. ^ Rogers, Vaneta (March 3, 2015). "Vivisecting Multiversity: Jim Lee on Mastermen". Newsarama. Archived from the original on September 8, 2015. ^ a b c d Gerding, Stephanie (August 12, 2015). "Batman: Europa, Dark Knight III: The Master Race Arrive in November". Comic Book Resources. Archived from the original on September 24, 2016. ^ Rogers, Vaneta (January 6, 2011). "Brian Azzarello Teams Batman & The Joker in Europa". Newsarama. Archived from the original on December 27, 2013. ^ Segura, Alex (October 6, 2010). "NYCC 2010: Batman: Europa by Jim Lee and co-writers Brian Azzarello and Matteo Casali". DC Comics. Archived from the original on December 28, 2013. ^ Johnston, Rich (March 2013) "The Black Bolt List". Bleeding Cool. pp. 49–50. ^ "BATMAN: EUROPA". Comic Book Round Up. Retrieved May 15, 2018. ^ Arrant, Chris (July 20, 2016). "Jim Lee Scales Back Plans On Suicide Squad Title". Newsarama. Archived from the original on July 21, 2016. ^ Terror, Jude (June 8, 2017). "See All 29 Jim Lee Trading Card Variants That Will Move Marvel’s Needle In July". Bleeding Cool. Retrieved April 20, 2019. ^ "28 JIM LEE Character Designs For 'New Age of DC Heroes' IMMORTAL MEN". Newsarama. October 9, 2017. Retrieved April 20, 2019. ^ McMillan, Graeme (April 20, 2017). "DC Unveils New Heroes From All-Star Creators: Teleporters, Assassins and Monsters". The Hollywood Reporter. Archived from the original on April 20, 2017. ^ Kit, Borys (June 6, 2018). "DC Entertainment President Diane Nelson Leaving Warner Bros.". The Hollywood Reporter. ^ Kit, Borys (June 11, 2018). "Geoff Johns Exits DC Entertainment for Writing and Producing Deal (Exclusive)". The Hollywood Reporter. Retrieved June 17, 2018. ^ Campbell, J. Scott (2008). "Pencils". deviantArt. Archived from the original on October 16, 2013. ^ "Reinventing the pencil: 21 artists who changed mainstream comics (for better or worse)". The A.V. Club. July 20, 2009. Archived from the original on December 28, 2013. Retrieved November 25, 2009. ^ Lee, Jim (January 27, 2005). "X-Men ReduX". Gelatometti.blogspot.com. Archived from the original on July 28, 2005. ^ Groth, Gary (September 1996). "The Barry Windsor-Smith Interview". The Comics Journal. Seattle, Washington: Fantagraphics Books (190). Archived from the original on December 27, 2013. Retrieved July 28, 2013. ^ a b c MacDonald, Heidi (August 2, 2013). "Help Jim Lee put his kids through college by buying Jack Kirby’s ARGO art". Comics Beat. ^ a b Johnston, Rich (January 26, 2012). "Jim Lee’s Hidden Tribute To Carla". Bleeding Cool. ^ Robertson, James (2006). "Bryan's Italian tour!". The Official Bryan Talbot fan page. Retrieved September 29, 2015. ^ "1990 Harvey Award Nominees and Winners". Hahn Library Comic Book Awards Almanac. Archived from the original on October 5, 2013. ^ "4th Annual Wizard Fan Awards". Hahn Library Comic Book Awards Almanac. Archived from the original on January 15, 2013. ^ "10th Annual Wizard Fan Awards". Hahn Library Comic Book Awards Almanac. Archived from the original on November 6, 2013. ^ "11th Annual Wizard Fan Awards". Hahn Library Comic Book Awards Almanac. Archived from the original on November 6, 2013. 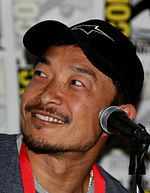 Wikimedia Commons has media related to Jim Lee.